“You don’t have to look very far to see the impact of climate change,” says 15-year-old Asher Millikan, at the Rocky Mountain Arsenal National Wildlife Refuge just outside Denver. Photo by Meredith Turk for BirdNote. The Arsenal was saved by birds. Now, this young woman is ready to save it again. The Rocky Mountain Arsenal National Wildlife Refuge is roughly the size of Manhattan. To the west are the Rocky Mountains, to the east Denver International Airport. It’s a rare natural oasis in the midst of a major American city. The Arsenal, as locals call it, is a Superfund site. Since European settlers arrived, its 16,000 acres of prairie have been transformed: first, into grazing and farmland, and then into a hazardous chemical facility. The US military and private industry did some of their dirtiest work here in the decades after World War II. The Arsenal is where weapons like napalm, mustard gas, and sarin were created. Pesticides and rocket fuel were formulated and stored here, and old weapons burned and buried. As the Arsenal was getting closed down in the 1980s, its future was uncertain. 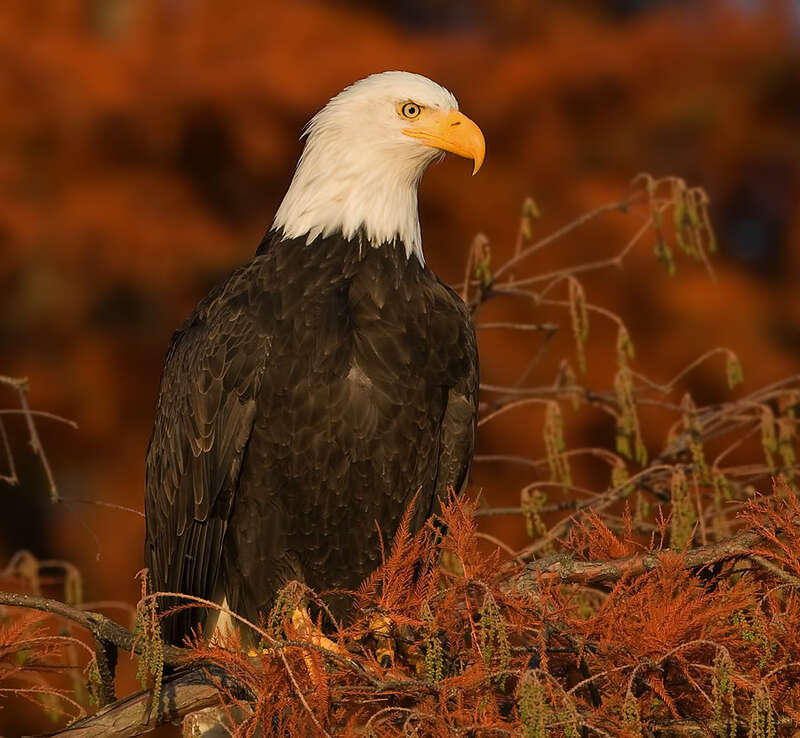 But in 1986, a pair of then-endangered Bald Eagles was discovered roosting on the site, in a stand of cottonwood trees lining a riverbank. 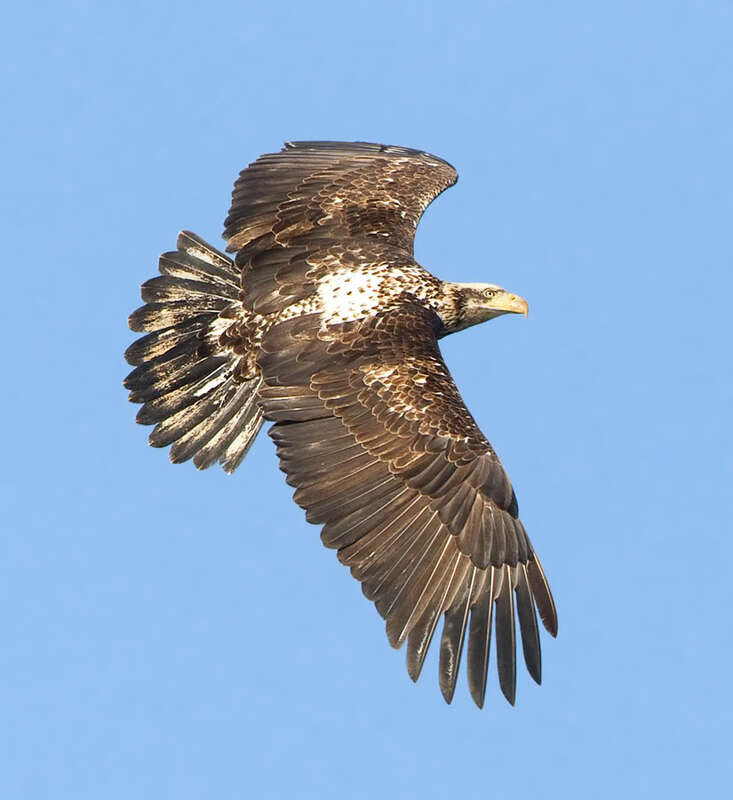 The discovery of the eagles, just a few miles east of downtown Denver, was galvanizing. 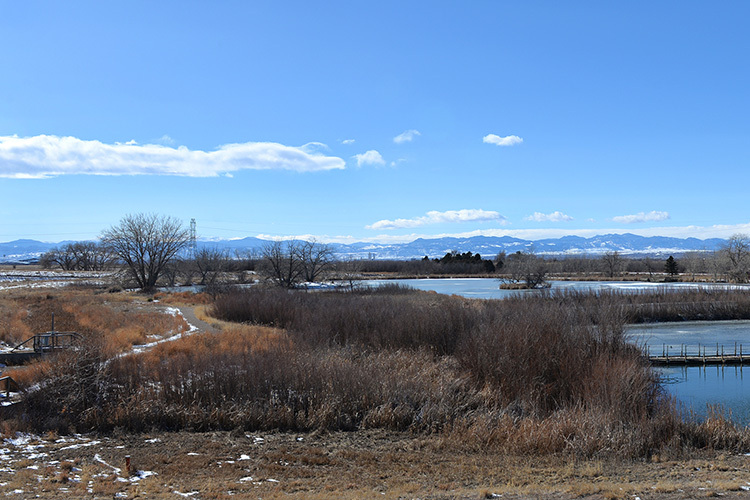 In 1992, Congress passed the Rocky Mountain Arsenal National Wildlife Refuge Act. As sections of the Arsenal are cleaned and remediated, they are transferred to the US Fish and Wildlife Service to become part of the new wildlife refuge. Today the Arsenal is still a Superfund site — and also home to more than 300 types of wildlife, including hundreds of species of birds. American bison roam here, alongside colonies of black-tailed prairie dogs. And the eagles are flourishing. Two pairs of Bald Eagles live here year-round. During the winter, up to 90 more migrate south to fish in the refuge’s rivers and lakes. But now the city is closing in on the Arsenal. The population of metro Denver has exploded this decade. Sprawling housing developments are being thrown up right alongside the refuge’s property line. Commuter trains to the airport pass by every few minutes. And now the climate is changing, too. It’s hotter and drier. This last bit of protected prairie, one of the most threatened ecosystems in the world, is under new threats even as it emerges from the shadows of its past. The Rocky Mountain Arsenal National Wildlife Refuge. This last bit of protected prairie, one of the most threatened ecosystems in the world, is under new threats even as it emerges from the shadows of its past. Photo by Meredith Turk for BirdNote. Chris Englert has walked every single neighborhood in Denver. She’s an author and a member-owner of a “walking cooperative.” Walk2Connect hosts thousands of walks all over Colorado, advocating for walkable urban design, encouraging people to get outdoors and connect to nature and each other. But as more and more people move in and burn and cut and pave and develop, she says that beauty is under greater and greater threat. Chris says everybody has a responsibility to do things differently, and even the smallest change is a great place to start. “It’s as easy as reusing your water bottle and starting there,” she says. Chris Englert and Asher Millikan set out on their walk at the Rocky Mountain Arsenal National Wildlife Refuge. About 15 people, young and old, attended. Photo by Meredith Turk for BirdNote. Now, Chris is turning the torch over to her 15-year-old daughter, Asher Millikan. Chris and Asher have the kind of mother-daughter relationship most just dream of. They are passionate and connected — and both love learning and talking about climate change. Together, they joined a program called Climate Reality Leadership Training. Started by former Vice President Al Gore, the Climate Reality Leadership program trains people to talk about the effects and causes of climate change and to take leadership roles in their own communities to share that story. Asher grew up in Florida, and she says that living near the ocean and learning about sea-level rise and seeing changes happening just in her lifetime were really important in shaping her views. And then she met Al Gore. Back in Colorado, living just minutes from the Arsenal and fresh off her climate reality training, Asher took action. 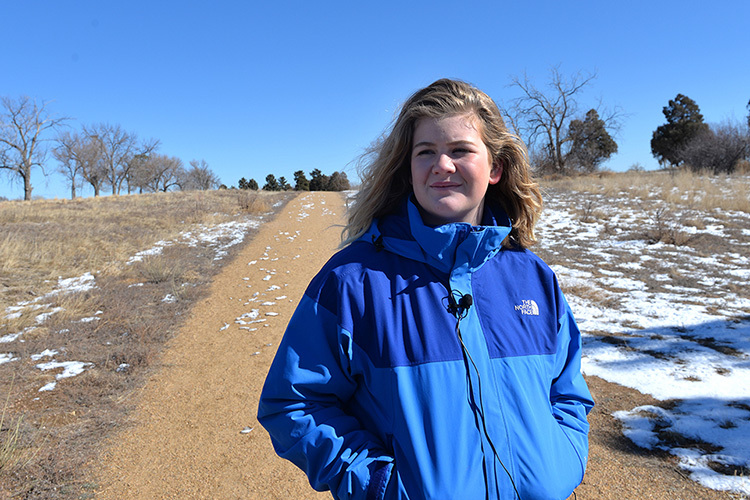 She realized that leading her own walk was the perfect opportunity to introduce her neighbors and young friends to the effects of climate change on the prairie landscape in their own back yard. 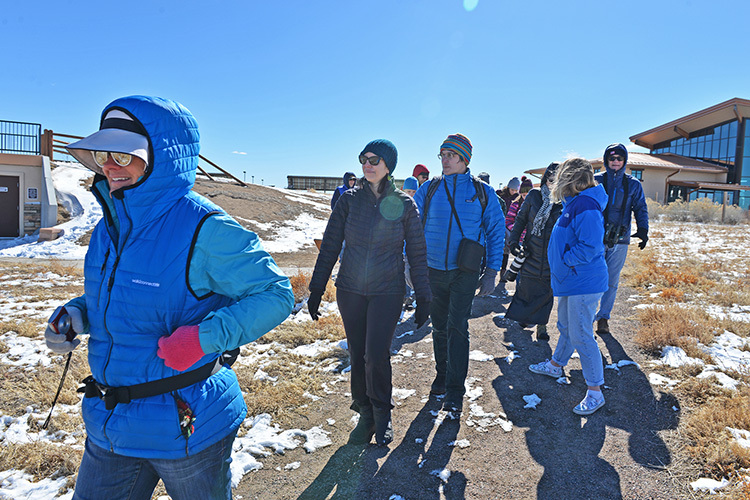 Asher Millikan, 15, leading a walk at the Rocky Mountain Arsenal National Wildlife Refuge, just outside Denver, Colorado. Asher is a member of the outdoors group Walk2Connect, and her walk focused on discussing the impact of climate change with youth and neighbors near the Arsenal. Photo by Meredith Turk for BirdNote. Asher just turned 15. 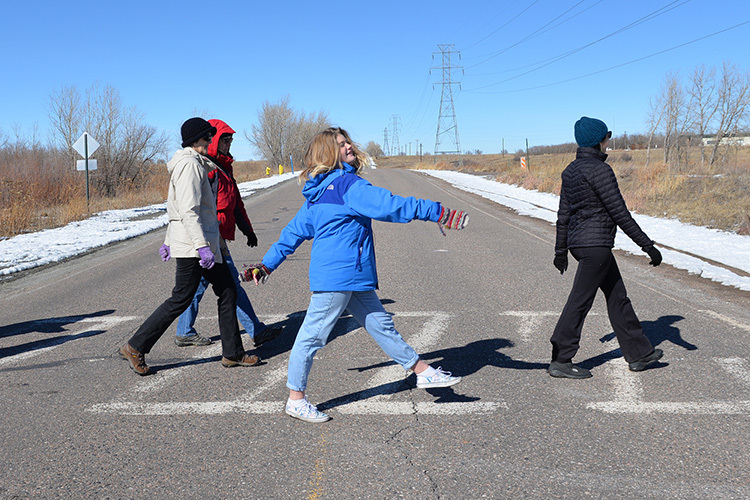 To share what she knows about climate change, she organized a walk on a Sunday in late February in her free time — that’s a special kind of dedication. Fifteen people showed up. It was a mix of young and old. Some were as young as nine and had never been birding before, while others have been birders for decades. Asher goes deep pretty quickly, starting out with a presentation on how climate change is altering the prairie that she loves. Once Asher finished her presentation, the group started out. It was a team effort. While Asher led the walk, Chris chimed in with her knowledge of years leading groups through this space. 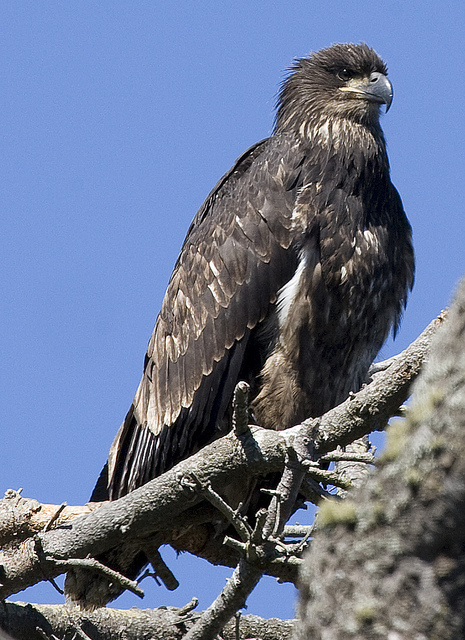 The same qualities that made the area good for a military installation and the old city airport make it an ideal home for Bald and Golden Eagles. It’s a large area on the eastern plains, protected by the Rocky Mountains and criss-crossed by creeks and rivers. 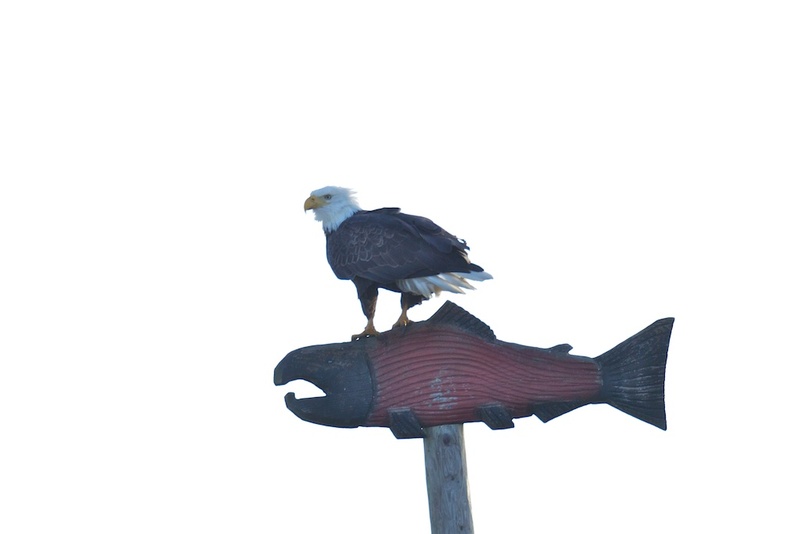 In the winter, birds of prey from Wyoming and Montana move south into the area to fish in the warmer waters. This is also where our national symbol goes when it dies. Since 1995, the Arsenal has been home to the National Eagle Repository. When dead Bald and Golden Eagles are recovered by federal and state conservation officers, wildlife rehabilitators, or even zoos, the remains are shipped to the repository. The eagles and their parts are then transferred back out to Native Americans and Alaska Natives for use in religious and other cultural ceremonies. But Chris and Asher say few people in Denver realize this special place is so close. 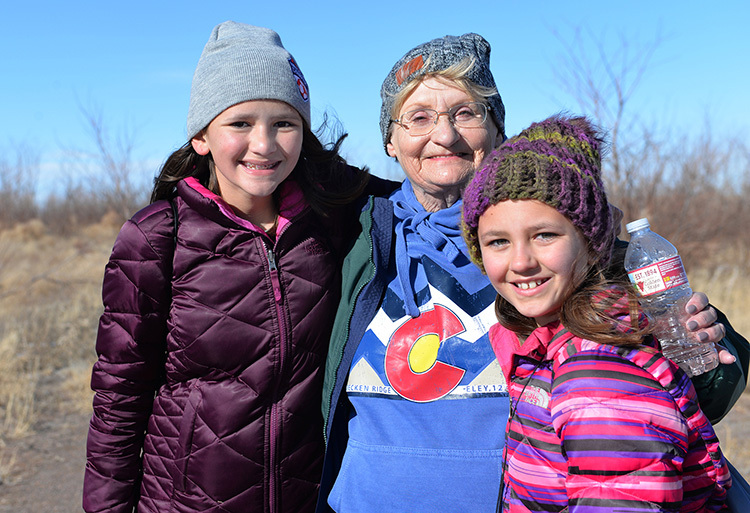 Katherine Patrick took her granddaughters Addison, left, and Fiona to walk through the Rocky Mountain National Wildlife Refuge. For both girls, it’s their first time birding and their first time seeing an owl outside of a zoo. Photo by Meredith Turk for BirdNote. Two sisters, Fiona and Addison, came out to the walk with their grandma. They had never been birding before, or to the Arsenal, but they did walks in the trails behind their home. They were eager to see what they could discover today. So why did they want to come? What are they hoping to find? “I really want to see a Bald Eagle or a bison up close, that’s what I’m really looking forward to,” Fiona says. Fiona Patrick is birdwatching for the first time, with her sister Addison looking on. They have just discovered a Great Horned Owl in a tree, sitting on its nest. “Wow, it’s just looking right back at you.” Fiona says she’s never seen an owl in the wild before. “We’ve only ever seen them at the zoo.” Photo by Meredith Turk for BirdNote. “I hope you realize how important this is,” Asher projected over the windy prairie. Her voice rose as she explained what she saw around her. Asher stayed focused on climate change, leading from what she had learned at her climate reality training. As the group walked, she explained that the prairie is more prone to wildfires than in the past. She talked about how humans are affecting the environment around them. And she pointed out bark beetle devastation and dry grass that could cause wildfires. Asher says the Arsenal is not the greatest evidence of climate change in the world, but it’s her back yard and that’s where she’s going to start. Asher challenged the group to think of a personal habit they could change that would have a positive impact on the climate and the environment. And after a moment, she asked each person to share the idea. “Use less plastic,” one says. “Walk more,” says another. The group didn’t spot any Bald Eagles that day, but they did see a Great Horned Owl nest, right near the trail, hidden in plain view. And the younger participants in particular loved seeing the prairie dogs, rabbits, and ferrets. For some of them, it was the first time they’d seen any of these animals outside, in the wild, rather than at a zoo. After the walk, Chris and Asher reflected on their first event together. Asher already knows the kind of life she wants to lead—it involves learning languages and working for the UN. She wants to have a big impact. “I feel connected to the earth and the people in it,” Asher says. Edited by Jason Saul. Additional editing by Ellen Blackstone. 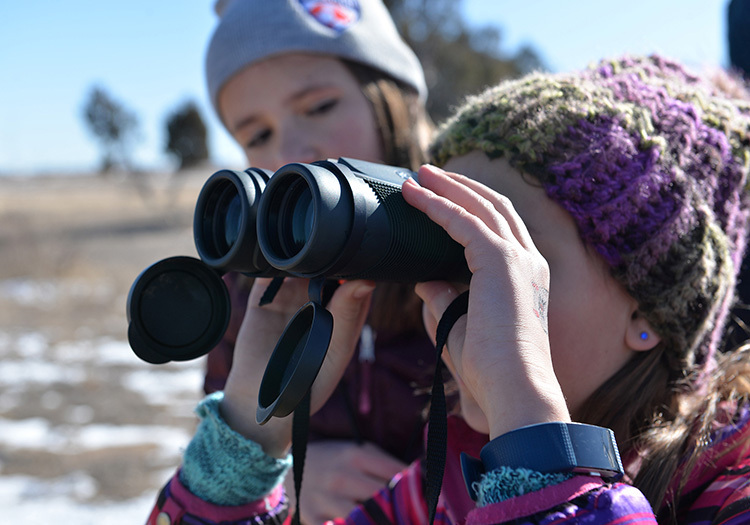 This story is the latest installment of BirdNote: Next Generation, an ongoing project designed to inspire, engage, and connect young listeners to birds and nature. It’s made possible by the Falconer Family of Seattle, the Bobolink Foundation, the Treeline Foundation, and the Peg and Rick Young Foundation. To add your support for bird-focused storytelling by, with and for young people, please make your gift today. Just note "Next Generation" in the comments section of the form. Thank you!